Welcome to Stage 2 of The Great Cardsmith Designer Search (GCDS)...The Hybrid Challenge! This challenge is designed to test your skills with creatively using the color pie in the context of hybrid mana. Only the 7 Cardsmiths with the best overall submissions will move on to the next stage. Your task is to design 5 traditional hybrid cards that could be printed in a generic standard legal set. 1) All 5 cards must be submitted as one post. Incomplete entries will not be judged. Entries can be edited until the judging deadline. If you edit an entry, please let me know by posting in the discussion thread. 2) All cards must use traditional hybrid mana and no other hybrid types. Regular mana (WUBRGC) can be used freely (no two-brid mana). No more than two cards of a single hybrid mana use (the three choice above) can be submitted. No more that two cards of a single rarity can be submitted. No more than two cards of a single card type can be submitted. Planeswalkers, artifacts, and lands will not be accepted. 6) COLOR IDENTITY: Each of the five colors must be represented at least once in the color identity of your cards and a single color can’t be represented in the color identity of more than three cards. 7) All cards must be made on or after October 16, 2018. No old cards will be accepted. 8) Only current evergreen mechanics or ability words can be used (besides hybrid mana). No cards with custom or non-evergreen abilities will be accepted. 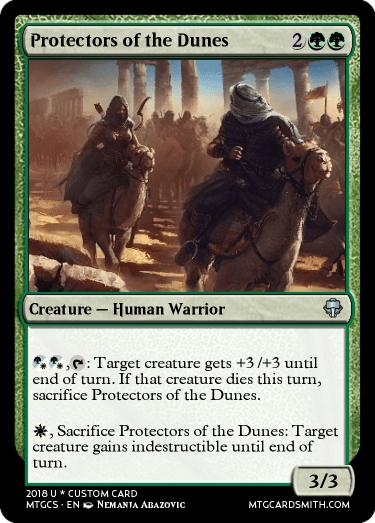 This includes -1/-1 counters, vehicles, protection, split cards, double face cards, etc. If you have any questions about which mechanics are allowed, just ask. 9) Cards should be appropriate for printing in a generic standard legal set according to modern design principles. -Tertiary abilities belong at rare or higher. Be sure to read how each color uses tertiary abilities in the mechanical color pie article under the ability itself (not in the section sorted by color). -Primary abilities should be used at common, although some secondary abilities can be used as well if they are used regularly. I will be relatively lenient in this regard. -Minor color pie bends are generally not too big a deal with hybrid mana, so I will be lenient with this as well. If you think you are designing a card that stretches the color pie, MAKE SURE IT DOES NOT UNDERMINE A FUNDAMENTAL WEAKNESS OF THAT COLOR. -I STRONGLY RECOMMEND you read over the Hybrid Mana links as they explain a lot of how you should design hybrid cards from a design perspective even though it is 10 years old and a lot of the color pie was different from how it is now. -Notably, many of the hybrid cards in the past really should have been done as traditional multicolor cards, particularly in Lorwyn-Shadowmoor block. Old hybrid cards are not typically good precedent for what abilities colors get and if they should be used on a hybrid card. Each individual card will earn up to 20 points, so each submission will be out of 100 points. Every card will get feedback and be graded according to this holistic scale. 2 – The card is assigned an appropriate rarity. 1 – The card is borderline with respect to the assigned rarity. 0 - The card should be assigned a different rarity. 0 - Negative flavor connection between card name and mechanics. 2 - No spelling, grammar, templating, or magic phrasing errors. 1 - One to two spelling, grammar, templating, or magic phrasing error. 0 - Three or more spelling, grammar, templating, or magic phrasing errors. 5 – All abilities associated with hybrid mana are in color pie for both colors AND any abilities not associated with hybrid mana are in color pie for the associated color(s). 4 – An ability associated with hybrid mana is a minor color pie bend for one of the hybrid colors AND any abilities not associated with hybrid mana are in color pie for the associated color(s). 3 - An ability associated with hybrid mana is a major color pie bend for one of the hybrid colors OR any abilities not associated with hybrid mana are minor color pie bends for the associated color(s). 2 - An ability associated with hybrid mana is a color pie bend for both of the hybrid colors OR any abilities not associated with hybrid mana are major color pie bends for the associated color(s). 1 - An ability associated with hybrid mana is a color pie break for one of the hybrid colors OR any abilities not associated with hybrid mana are color pie breaks for the associated color(s). 0 - An ability associated with hybrid mana is a color pie break for both of the hybrid colors. -Does it show novelty and/or creativity? -Does it innovate with Hybrid Mana? -Is the card different from similar cards made before it? -Is the rate (Cost/power ratio) appropriate for this card and its abilities? -Is it an appropriate power level for limited, factoring in rarity? -Would it cause problems in constructed formats? -Would it be fun to play? -Would it create repetitive or unfun play patterns? -Does it create rules issues/paradoxes? The Top scoring 7 Cardsmiths will advance to the next stage of the GCDS. 1st: 3 faves of your choice. 2nd: 2 faves of your choice. 3rd: 1 fave of your choice. The Cardsmith who is eliminated this round will receive 4 favorites of their choice. This contest will close for judging on Tuesday October 23th at 4:00 PM EST. No late entries will be accepted. I understand this contest is a big commitment, so each Cardsmith will earn a total of 3 days “delay time” banked for the entirety of the GCDS. If you need more time for your submission, I will delay judging the amount of days (24 hours) you request. You can request 1 x 3 day extension, 3 distinct 1 - day extensions, or some other integer combination. In order to use your delay time, message me with the amount of days (1, 2, 3) you want BEFORE the judging deadline has passed. Your delay will only apply to your entries for that stage, not to the others'. You may use no more than one instance of delay time for each stage. When a delay occurs, I will announce it in the thread. If you have any questions, feel free to post them in the thread below. Stage 2 has begun! You have until next Tuesday 10/23 at 4PM EST to get your submissions in! If you have any questions, particularly about delay time, the entry criteria, or the judging criteria, do not hesitate to post them in this thread. Why are -1/-1 counters not evergreen? 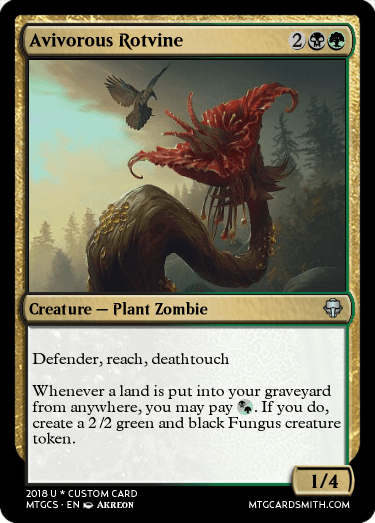 -1/-1 counters, like split cards, transform, Vehicles, etc are deciduous which means they could be used in any set but will only be used infrequently when appropriate. Technically, -1/-1 counters should not have been allowed for the last stage, but I forgot to specifically call them out in the entry criteria so once people started submitting cards that used them and I realized it, I just let it slide with no score penalty whatsoever. For this challenge they will not be allowed. According to https://mtg.gamepedia.com/List_of_Magic_slang#Deciduous the deciduous mechanics are only Protection, Hybrid mana, split cards and double-faced cards, colored artifacts, Curses and Vehicles. I think +1/+1 and -1/-1 counters just are, but I won't use them. For some reason both counter types are not listed on either list (deciduous or ebergreen) but I am sure they are deciduous. 1) clarified wording around which types of mana you can use (hybrid + WUBRGC, no two-brid or Phyrexian or snow mana). 2) made a note that the links I posted for hybrid mana are 10 years old and should only be used as a guideline of how to find and evaluate color pie overlap, not as a color pie guide. I couldn’t find a newer article by WOTC about hybrid design in such detail, so if anyone knows one and wants to share feel free to post it. If anyone has any questions about either of these items, let me know. I, in my design philosophy, am not a fan of hybrid mana cards. They either mean color bends/breaks or cards that have to be weaker than what they would be monocolored. I think they are interesting when tethered to a single color that already gives it the ok to be another color. So, even though I can count the number of hybrids I like on one hand, here are some that I think are neat. For whatever reason, I had a big hunger to build a banding card that could actually be played. This card is not as strong as banding by any means because it has to be simpler if it's going to standard, but the effect is similar. Since banding was a white mechanic, the card wanted to be white. Since the method I used to simulate the effect was pump, it also needed to be green. Next I was really feeling all the green combos so had to decide which other one to do. I decided Gruul to maximize the number of colors we didn't do last week. Being common, it couldn't be that cool, especially being a hybrid card. But Green and Red both do this effect sometimes so why not. It was too boring of a card for me at first so I threw in the dragon pump and got Temur art. The tribal pump might seem strong, but for the high cmc dragon tribe, this would only be late game while you are already winning. The third card would be the one that saw the most play, and is the strongest as the rare I designed. This is kind of like Quicksilver Amulet or Sneak Attack, but being blue white in a way that means this has to be defensive. This is definitely a build around and rather hard for a control deck to run, but there is so much fun with it. You can get your etbs over and over again if you opponent keeps hitting you so cards like Mnemonic Wall or Mulldrifter have a new toy and it makes the window for opponents to kill them a lot smaller. Rakdos is my guild so I was happy to make a card, even a draft fodder one, for it. I think this card is fun in sealed/draft but mostly unplayable in formats with much removal. 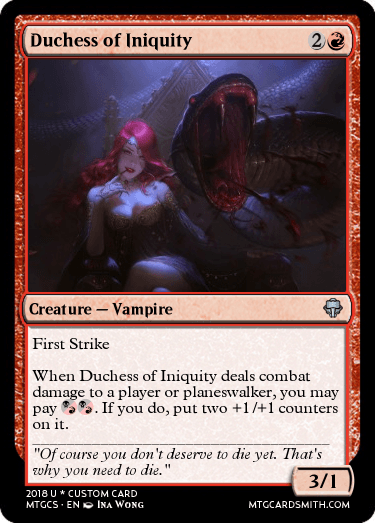 A 3/1 first strike is a sweet mid game blocker or becomes a threatening 5/3 first strike if you manage to get in with her and mana up. In the rpg game I made, the mtg vampire mechanic is kind of like my bloodflow mechanic. Dimir is a hard one to design for. The things blue easily does black can pay life to do, but blue doesn't need to pay life. Blue doesn't do much of what black does. In the articles, they talked about this problem too. Blue black cards are easy to design, but hybrids are hard to build. So, as someone who has an edh deck with 15 polymorph effects, I decided to do that instead. 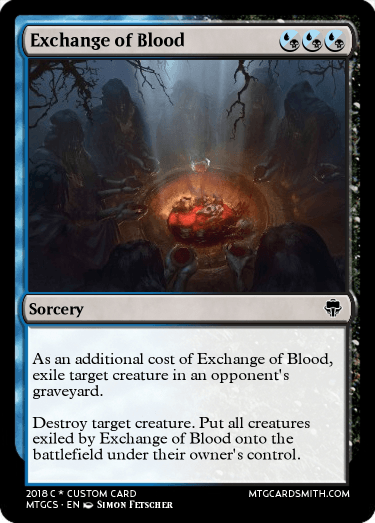 Blue can polymorph, black can reanimate, so let's do that. you trade their late game big dude for their small turn one guy in draft or an aggro standard. There will also probably eventually be a very niche edh deck that this would be a great card in. I can use "prevent damage," right? 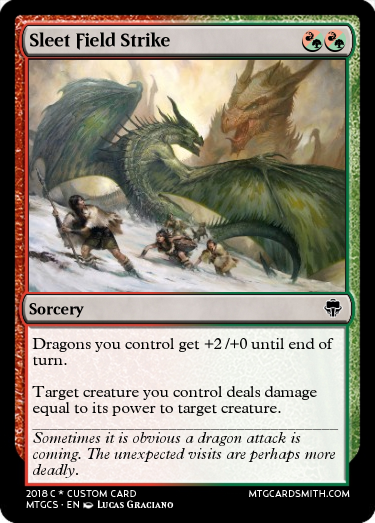 Can you explain how/why WotC uses "When you do" instead of "If you do?" I feel like they've been using that "When" wording lately, but I don't understand it. If I'm not mistaken, "When you do" is a new technology that they call "reflexive triggers". 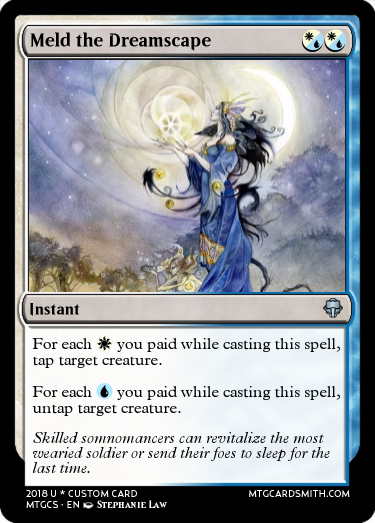 They use it to allow you to choose your targets once they effect reach that stage, instead of while you cast the spell, to avoid things like fizzling, or to allow you to choose your targets with knowledge from effects of the card. So, my guess is you still use "If you do" in any other case, a.k.a. when you don't need a reflexive trigger, usually when there's nothing to target. It first appears on Heart-Pierce Manticore I believe, and they've been using it since then which is why it feels they've been using it more and more. Could you define "reflexive triggers" a bit more? A reflexive trigger is a delayed trigger that occurs “when” a condition is met. It always uses the “When you do” phrasing. Compared to typical “if you do triggers” it has a few differences. The biggest one is that it allows effects to be separated into two by a decision where “if you do” puts it all in one trigger. For example, Using Heart Piercer Manticore as an Example, when it enters the battlefield a trigger is placed on the stack that prompts you to choose whether to sac a creature or not. Nothing happens after that if you don’t sac a creature, but if you do sac a creature another trigger is placed on the stack that deals damage to the target when it resolves. The difference in how a reflexive trigger plays out on this card is huge compared to the “if you do wording”. 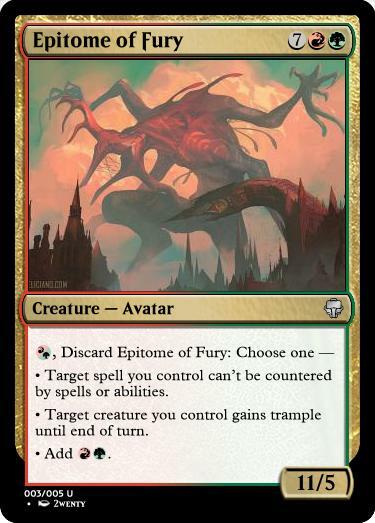 If this card used “if you do”, when it etb the sacrifice trigger would go on the stack and if You sacrificed a creature would resolve and right away deal the damage in a single trigger. Another great example is hypothesizzle from GRN, which uses reflexive trigger as well. The main advantage of reflexive triggers is that they allow for more logical response timing on the opponent’s part. 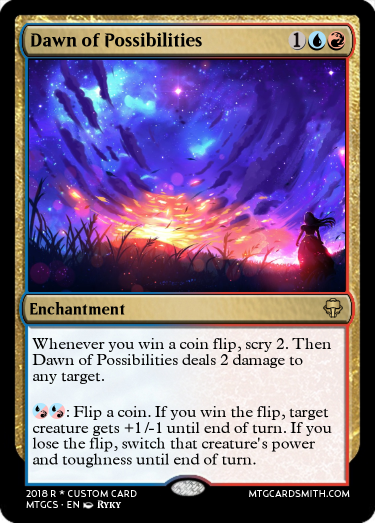 For example, if hypothesizzle was worded the “if you do” way, an opponent would have to cast a pump spell on their 4/4 in response to Hypothesizzle. When hypothesizzle resolved, the caster could then just choose not to discard a card to deal 4 damage, which would make the opponent’s trick Wasted. So reflexive triggers promote better interactivity ultimately? This one is inspired by an old design of mine: Bane of the Pupeteer. 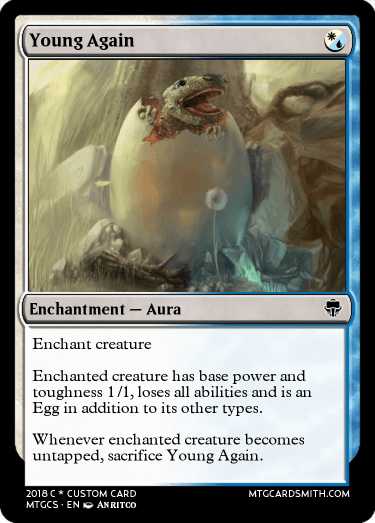 I really like this variation because it's flavourful (in case it wasn't clear, untapping = hatching), kind of witty, and it has interesting mechanical implications (for instance, as long as you attack every turn with your creatures, this enchantment won't be a threat since your creatures will untap at the beginning of your next turn anyway). It's a rarely explored overlap between Blue (Turn to Frog) and White (Humility). That's a more clean and simple design meant to explore other aspects of hybrid design space in general. It's really a more Spikes-oriented card, with a lot of numbers to go through in terms of mana base and optimisation. It has the potential to be really back-breaking on turn 3, especially against aggro but, interestingly, despite being hybrid it's a very demanding card colour-wise. I like the touch of dark humour in the title, as here "Rest and Glory" is meant for the dead soldiers, not the victorious ones. This final design plays in the obvious "BG Graveyard lands" design space, but there isn't that many options for hybrid designs so I went with the classic and tried to interpret it in a new way. The final result reminds me a bit of Poison-Tip Archer and a weaker Drake Haven though I didn't start there. Are cards like Selesnya Guildmage (http://gatherer.wizards.com/Pages/Card/Details.aspx?multiverseid=247386) or the other Guildmages from Ravnica: City of Guilds allowed? They aren't included in the linked articles despite being hybrids. @ChuckTesta as long as the card you design fits the contest criteria (and the RAV guildmages do) they are allowed. The links are just helpful for understanding hybrid design philosophy and shouldn’t be taken as restrictions on which types of cards you can design. Just a reminder, there is 24 hours left to submit your cards. If you need an extension and want to use your "delay time" you need to message me in the next 24 hours before the deadline of 4PM EST tomorrow (10/23). From cardsmithing experience, hybrid mana is one of the most frustrating mechanics to get right. With strict rules and limited design space, the line is fine between creating mature, well-thought-out cards and...not. 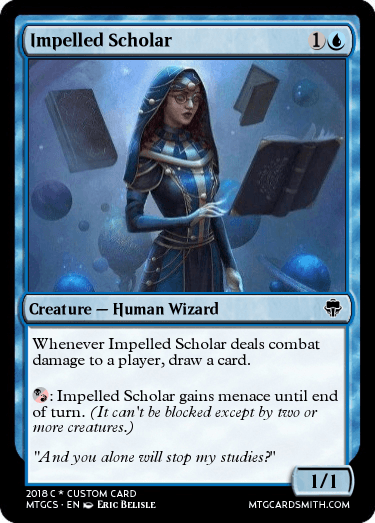 Clean and flavorful, Impelled Scholar is my favorite of the bunch, combining Curiosity abilities signature of blue (Scroll Thief and Stealer of Secrets) with red and black's shared mechanic Menace. Meld the Dreamscape plays into the same design space @ningyounk discovered as well, but I decided to have the abilities be opposites of each others to further connect the card. This card is the king of combat tricks, manipulating the state of the battlefield into your advantage in any situation. 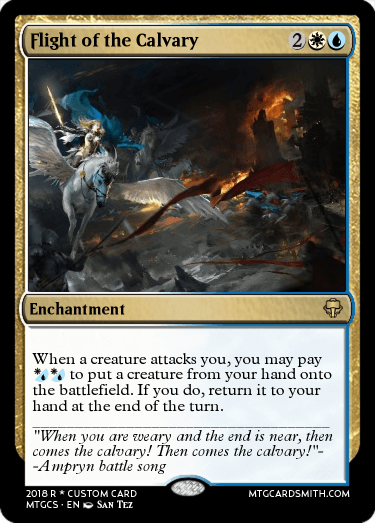 Seismic Uprising promises a hefty amount of damage coming your opponent's way, whether through a hefty creature or simply wearing them down as you cast your spells. 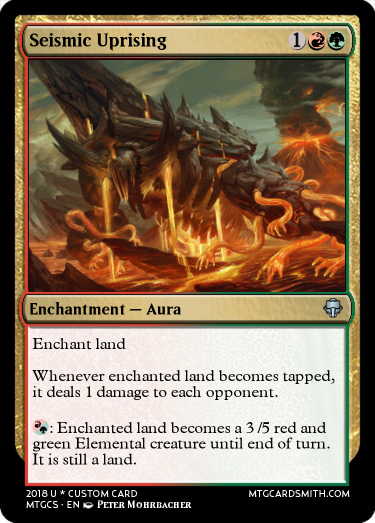 Red and Green both share land animation, which justifies the use of hybrid mana. 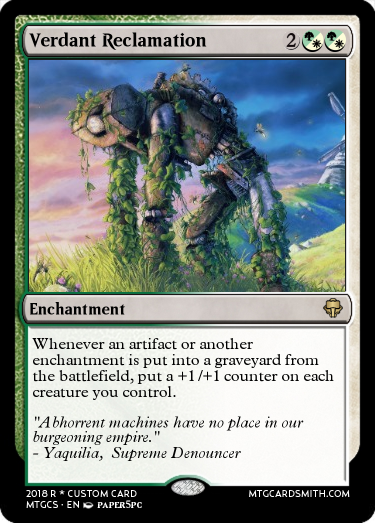 Verdant Reclamation fuses Green and White's love of +1/+1 counters and hate of artifacts and enchantments. You can use this card in games of Commander to pump your board, use it in an Artifact deck to turn your losses into gains, or in strange Enchantress decks chock full with Seals of Primordium or Seals of Strength. Sporoloth Lifetiller converts the death of your allies into options, depending on your mana. You can either restock your boardstate with Saprolings, or you can drain your opponent of health. 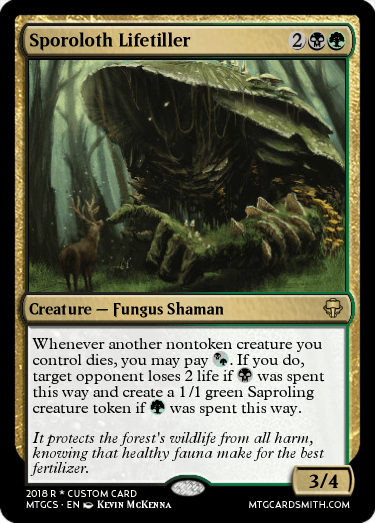 Either ways, this fearsome fungus will inspire any Golgari rot-farmer worth their salt. A somewhat late question, I know, but would artifact creatures be accepted? I am going to need to use 1 day of my delay time, I won't have access to my laptop again until after the deadline. There are only 4 hours left until the deadline! Make sure you get your card submussions in! If you need an extension, just message me that you are using delay Time (ChuckTesta has already done so). @bnew07 I will use one of mine. Will get it by tonight.